While aquatic turtles will indeed make great pets, the problem is that they typically need large enclosures to survive. Thankfully, with species like the map turtle, they are generally smaller, and hence, they do not need to have a large habitat. Also known as saw back turtles, they are endemic in North America. This means that North America is the only place where they can be seen in the wild. 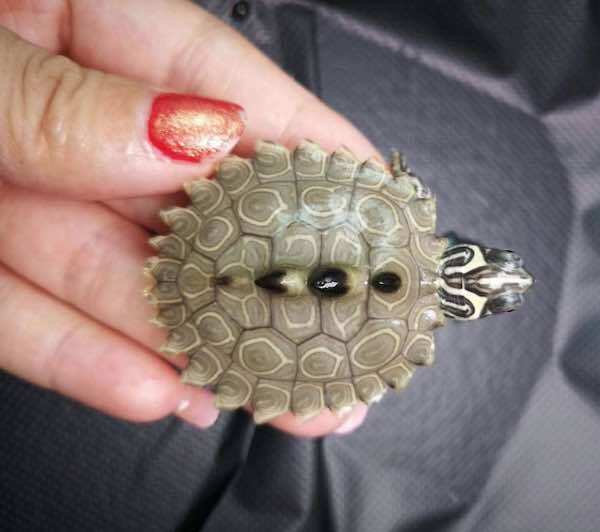 There are 13 species of the map turtle, which include Northern or common map turtle, false map turtle, Alabama map turtle, Texas map turtle, and Pearl River map turtle. The map turtles are named after their physical appearance, although it should be pointed out that different species exhibit different characteristics, especially when it comes to coloration. Nonetheless, one thing that is common is that their carapace has a sort of pattern that looks like a map at first sight. The map lines are usually orange or yellow. Between the lines, you can see brown and green. Another physical characteristic of a map turtle is the presence of thick lines on the face and limbs, which are usually bright yellow. Map turtles are also known for being relatively small compared to other types of aquatic turtle. On average, the females have an approximate length of seven to ten inches. Males, on the other hand, are commonly three to seven inches in length. On average, the lifespan of a map turtle is anywhere from 15 to 20 years. Map turtles are known for actively basking under the heat of the sun. While there are some turtles that spend most of the time burrowing, in the case of map turtles, they spend lots of hours enjoying the heat of the sun. Despite this, they also prefer to be near the water, which will allow them to swim anytime they want. They are also known for being friendly species, which is why they are commonly chosen as pets. However, take note that females tend to be more dominant. If possible, avoid having them in a large group. In the wild, you will often find map turtles in clear rivers that are fast-flowing. With this, you have to recreate such an environment if you want to have it as a pet. Although map turtles are small, you need to have a large aquarium that will provide lots of room to swim and move. For full-grown turtles, you need an aquarium that has a capacity of at least 75 gallons. Since females are generally larger than males, they also need to have a larger housing. More than the size of the aquarium, the more important consideration is the quality of the water that will be used in the tank. The clarity is critical, which makes it important to install a large water filter. This will also eliminate the waste and buildup in the water. are two of the best choices worth considering. An outdoor pond will also be an ideal environment for a map turtle, especially for larger species or if you intend to take care of more than one turtle. Make sure to provide them with a basking spot. Map turtles eat both animal and plant matter, making their diet omnivorous. Because they are aquatic turtles, their foods are floating in the water. When they are young, they prefer plant matter. As they grow older, however, their jaw muscles become developed, which makes it easier to eat animal matter. Some of the best foods that can be given to feed map turtles include blackworms, bloodworms, feeder fish, crayfish, crickets, and earthworms. Dark and leafy vegetables will also be great, such as parsley, dandelion greens, and romaine. They also enjoy eating freeze-dried shrimp. There are also many prepared and commercially-available foods that will be good for map turtles. Generally, you have to look for those with about 30 to 40% protein, less than 20% fat, and a high ratio of calcium to phosphate. to the turtle to supplement its needs for Vitamin D3. Shell and fungal infections are some of the most common problems that will confront map turtles. The easiest way to prevent this is to provide them with enough sunlight. If they are indoors, as mentioned earlier, a basking lamp will be helpful. The lamp may not be enough, so you will have to occasionally take the turtle outside. Similar to most species of aquatic turtles, map turtles do not like to be cuddled or held. Do not pick them up unless it is necessary to do so. Immediately wash your hands after holding map turtles as they can spread salmonella. Especially if you will keep the turtle in outdoor ponds, add lots of natural plants, such as water hyacinth or water lettuce. This will help to maintain a high level of oxygen. Females can be aggressive, so be sure to not make the space crowded. Adding decors will also help to give each turtle a private space, especially when basking. Better yet, keep them in separate tanks.